Partially recorded in Kingston, Jamaica, with Chris Blackwell, 'Yell Fire!' is part of a thematic trilogy that includes the film and book 'I Know I`m Not Alone,' which document Franti`s recent visits to Iraq, Israel and Palestine. That`s a lot of ground for anyone to cover, but his ambitions pay off on this strapping, if sprawling, collection. Franti wastes no time getting to the point: opener "Time to Go Home" brandishes enough slogans to populate an entire anti-war rally. Despite its framing device, "Yell Fire!" leaves time for some geographically appropriate reggae ("Hello Bonjour," featuring Sly & Robbie), danceables ("Hey Now Now") and unapologetically optimistic ballads ("One Step Closer to You"). And though Franti puts those fierce politics first, he also neatly distills the diverse styles he`s visited throughout an ever-impressive career. 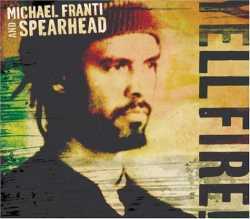 Summary of Michael Franti and Spearhead: Yell Fire!